OVPN gets so many things right, but the service's performance makes us nervous about recommending it. One of the big questions many people have about a VPN service is just how well they can trust a company’s no-logging claim. OVPN tries to allay that concern as much as possible by running its own small network of servers in seven countries. On top of that, the company doesn’t allow its hardware to hold internal or external hard drives, USB sticks, or CD-ROM drives. That, of course, begs the question where it stores the operating system and server configuration. The company tells me that it runs the operating system and all system configuration files on RAM. If you’re interested to learn about how this works check out OVPN’s blog post on the topic. OVPN’s Windows desktop app is very basic. At the top are four categories: Connections, Statistics, Support, and Account. The primary places that users will be looking at most days are Connections and Account. OVPN with an active connection. Connections is where you see all your options for connecting to the VPN. 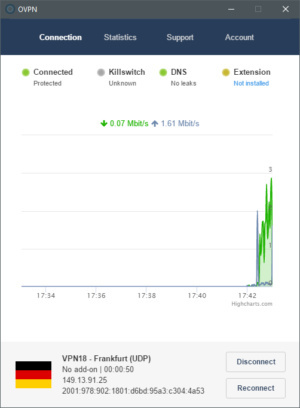 By default, OVPN connects to the fastest server based on your location. If you need a specific country, such as the U.S., you can let OVPN determine the best server for you within that location. Finally, you can drill down and personally select one of OVPN’s 56 servers. The automated approach based on speed is quite common for a VPN service, but it’s nice to see a company spell it out for the user. Once you’ve chosen your connection options, click Connect and OVPN takes care of the rest. The Account section would be more accurately called “Settings” since this is where the desktop app houses all its various options to tweak. 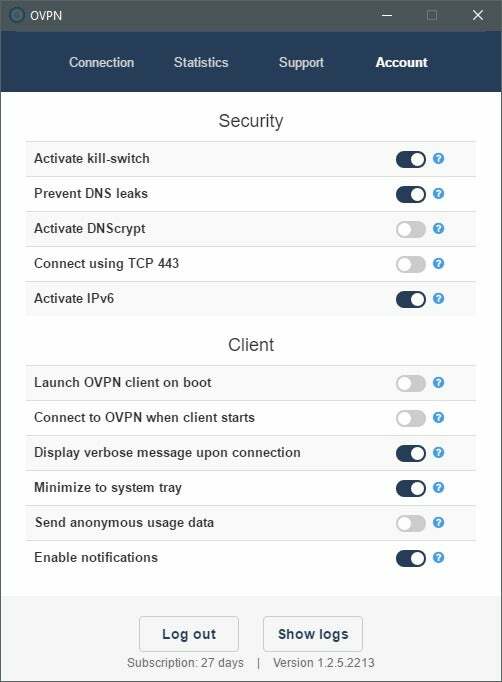 By default, OVPN turns on its kill switch that shuts down all internet activity when the VPN connection drops. Also on by default is IPv6 support, launching the desktop app at boot, and various notification options. One thing to note is that when you hit the minimize button, OVPN disappears to the system tray. If you’d rather it stayed on the taskbar you can do that at Account > Client > Minimize to system tray. OVPN’s various options for Windows 10. 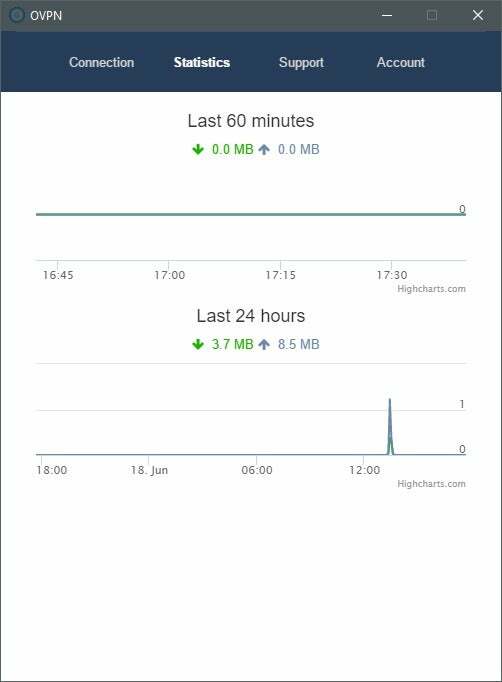 Moving on to Statistics, this section shows two bandwidth graphs of your activity over the last 60 minutes and the last 24 hours. The Support section, meanwhile, is a simple email contact form where you can send up a flare for help. Note that there is a check box at the bottom of the email form to send logs that are saved on your PC at AppData > Roaming > OVPN > logs. You can also view the logs by going to Account > Show logs. In addition to the desktop app, there are also browser extensions. Most VPN extensions are just for using the VPN’s servers as a proxy. 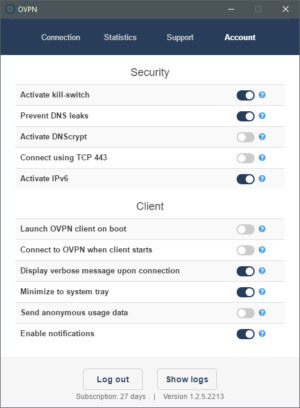 OVPN’s extension, by contrast, doesn’t offer a proxy. Instead, it blocks ads, potential webRTC leaks, and it will not allow your browser to connect to certain sites unless you’re connected to the VPN. This last feature is entirely optional and only works if you specify that certain sites should only be reachable over the VPN. To test OVPN we couldn’t do our usual test across five far-reaching locations that include stops in Asia and Australia. OVPN only covers seven countries in North America and Europe (U.S.A., Canada, U.K., Germany, Netherlands, Sweden, and Norway). So for this test, we looked at speeds in the U.S.A., Canada, Germany, the U.K., and Sweden. Overall, OVPN did not fare well. In out first round of testing it failed to reach double-digit Mbps speeds in every single country we tested. Overall, OVPN was able to maintain less than 12 percent of the base speed using an average of the five aforementioned locations tested. That’s one of the worst speed results we’ve seen—though notably OVPN’s upload speeds were outstanding with over 60 percent of the base speed maintained. To see if this was truly representative, we tried changing the connection from UDP to TCP—a one-click setting in Account. When we did that, the scores went up to a 21 percent overall average, which is better, but still pretty low compared to what else you can find out there. When you sign up for OVPN the form asks for a username, password, and email address. The email, however, is entirely optional, making this a good choice for those looking for anonymity. On top of that, OVPN accepts cash just like its fellow Sweden-based VPN (and our favorite service), Mullvad. To use cash, you sign up for an account, and then send OVPN an envelope with the cash and a note with the one-time code you see on the payments page. Once the company receives it, the credit is added to your account. Now obviously there’s a risk to sending cash in the mail, but for those looking for anonymity the risk might be worth it. Beyond cash, OVPN accepts PayPal, credit card, and Bitcoin via Coinbase. If you pay via Bitcoin, OVPN says you can expect to wait 30-40 minutes before the transaction will be authorized and your account credited. OVPN is run by OVPN Integritet AB. The company doesn’t provide a street address, but its mailing address is Box 388, 114 79 Stockholm. The company’s founder is David Wibergh. I wish I could give OVPN a better recommendation, I really do. The company gets so many things right: it takes no-logging very seriously, you can pay with cash, and you don’t have to supply an email address. But that performance result is troubling. 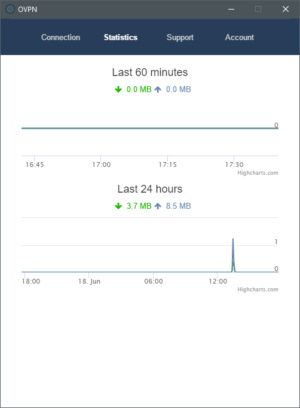 Now, we should note that your experience may vary, but with performance this low in our tests we simply can’t give OVPN a big thumbs up at this time. We’ll be keeping an eye on OVPN, however, and if the speeds improve we’ll be sure to revisit this review.